Sometimes even doorways become obstacles to getting around your home. With an automatic door opener, you can easily open any door. We offer door openers from Power Access. They fit most interior or exterior doors, plug directly into a wall outlet, and are activated by wired or wireless remote controls. They can be configured to shut automatically, but doors can still be opened and closed manually when desired. Electric door locks are also available, which can be unlocked manually with a key as well. As an alternative to the remote, a variety of wall-mounted push plates are available. While these openers offer easy installation, MediEquip installers are available. No modification of the door or jambs is necessary. The openers are virtually maintenance free, but if you need any kind of service on your opener, we can help with that, too. 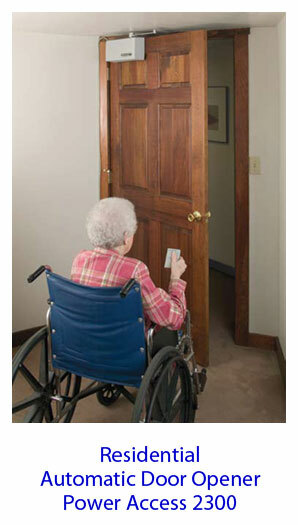 The Power Access 2300 is a low cost residential door opener perfect for any house, condominium or apartment. The 4300 is a heavy-duty opener suitable for businesses, schools, churches, community centers or any other commercial buildings.